Introduction: Computer-aided design (CAD) and computer-aided manufacturing (CAM) monolithic crowns are gaining momentum. 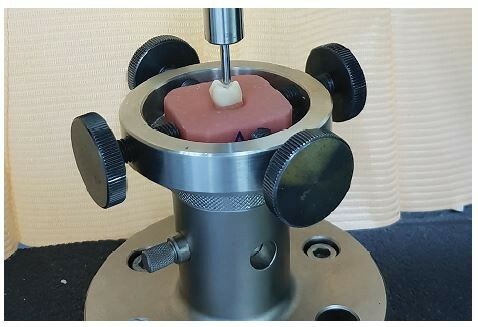 Limited evidence exists about the effect of tooth preparation total occlusal convergence (TOC) on marginal and internal gap distances in ­addition to load to fracture values. Aim: The aim of this study was to evaluate, by microcomputed tomography (µCT), the influence of 12° and 20° TOC on marginal and internal adaptation of zirconia-reinforced lithium silicate (ZLS) crowns. Moreover, values of load to fracture with and without initial cyclic loading (CL) were compared. Material and methods: Forty ZLS crowns were fabricated on dies with TOC of 12° and 20°, 20 crowns for each group. µCT was used to compare marginal and internal adaptation. Each specimen was measured at 140 points distributed on all tooth preparation surfaces for 2D gap distance assessment. 3D gap volume was also evaluated. Crowns were then cemented and divided into two subgroups; the first was stored in distilled water (no cyclic loading [NCL] subgroup), the second was subjected to CL (CL subgroup). Results: Factorial repeated measures ANOVA followed by Bonferroni post hoc in addition to independent and dependent t-tests were used for statistical analysis. Marginal gap, absolute marginal discrepancy, and occlusal gap measurements showed significant differences between the measurement sites. Static load to fracture values showed significant differences between TOC groups for both NCL (P=0.011) and CL (P=0.025) subgroups. Conclusion: An increase of TOC from 12° to 20° did not affect marginal and internal adaptation but resulted in higher values of load to fracture of ZLS crowns. CL simulating 1 year of service did not result in fatigue failure.